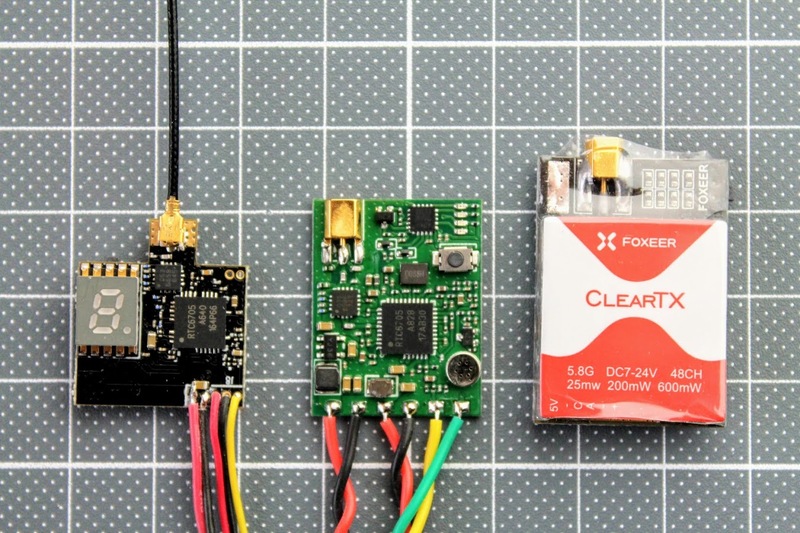 AKK Race VTX is the newest FPV video transmitter from AKK Technology. It is definitely one of the most interesting product from their VTX line. 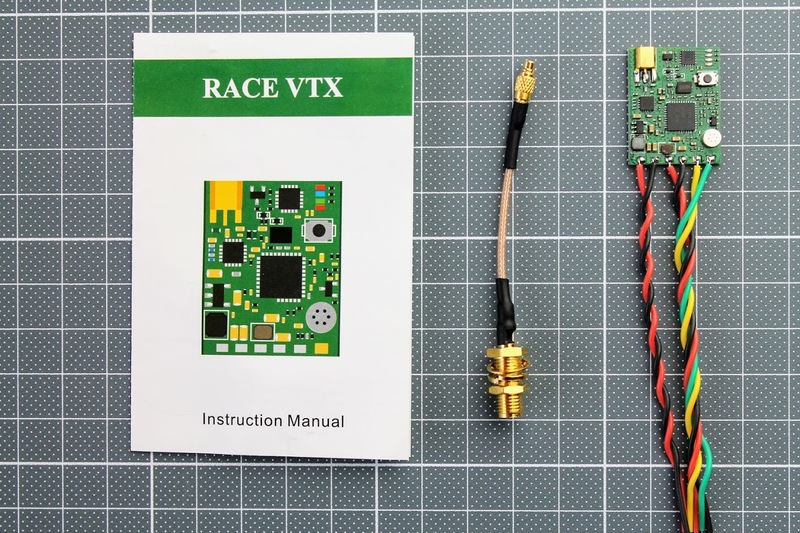 Lets take a closer look at the Race VTX. 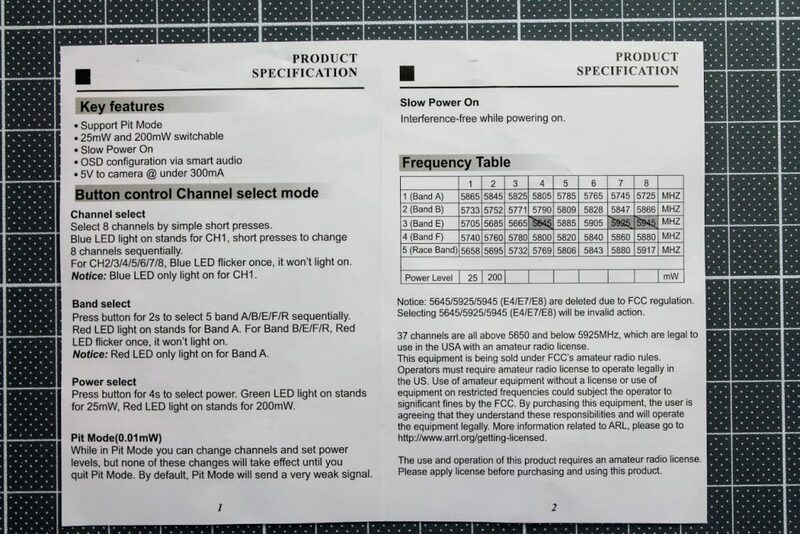 Package contents: 1x VTX, 1x MMCX to SMA pigtail and instructions leaflet. Race VTX has MMCX antenna connector, microphone on board, camera power supply LC filter, push button and 4 LED indicators. 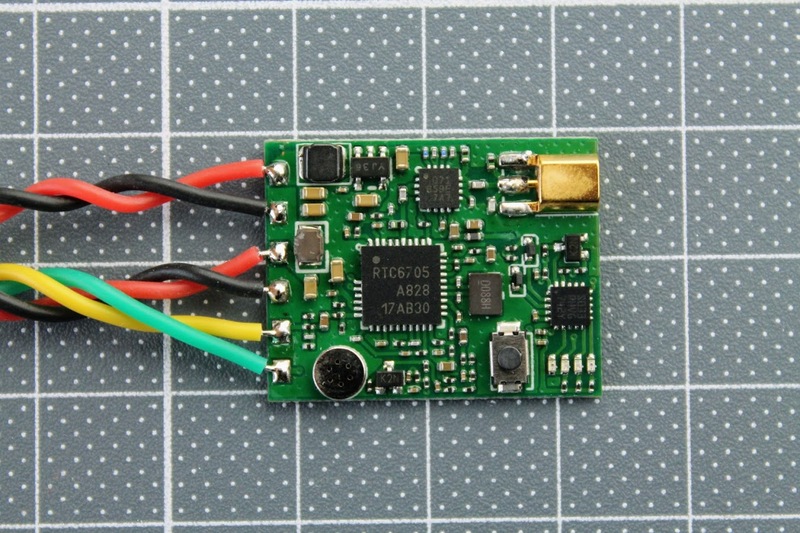 The back side of the VTX is perfectly flat and the VTX is very thin with only 3.5mm at the thickest place – MMCX antenna connector. 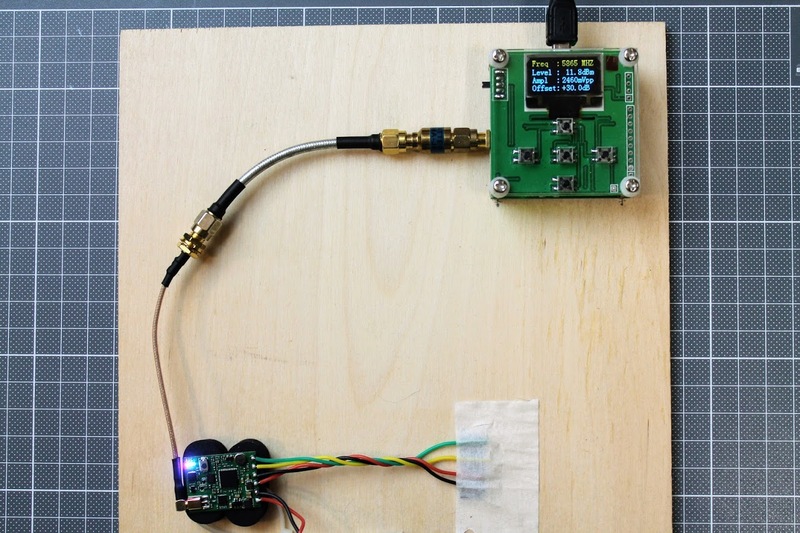 This makes the installation of the VTX easier even in the tight builds. AKK Race VTX weights 3.5 grams (with wires). 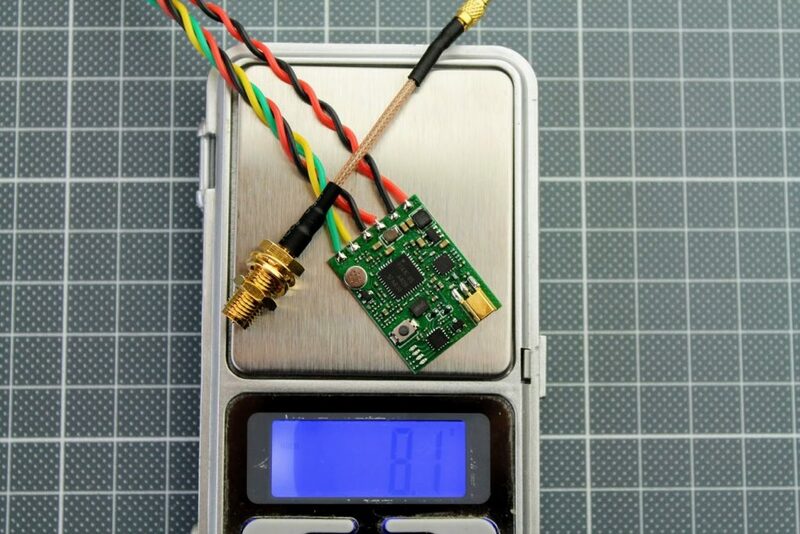 If you add the MMCX to SMA antenna pigtail, then overall weight increases to 8.1 grams. But the VTX actually weights only 2.3 grams without thick and bulky wires. You can replace them with thinner gauge silicone wires or shorten them down. 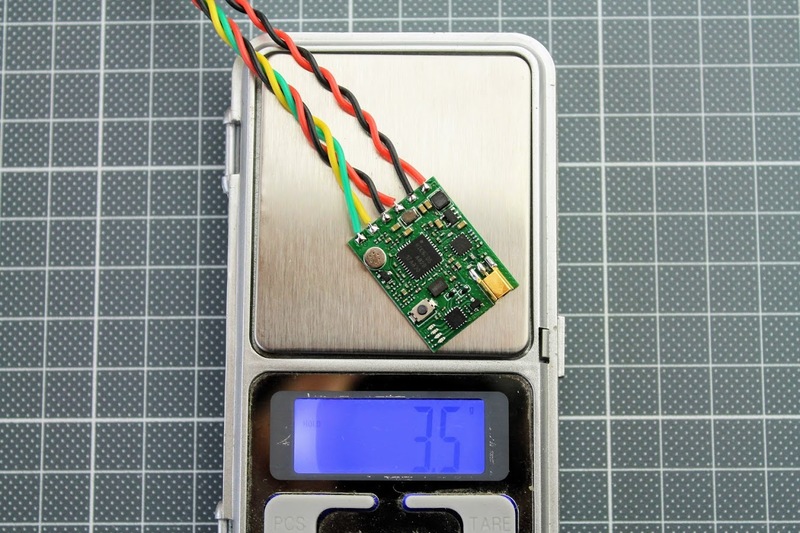 AKK Race VTX size is comparable to Eachine VTX03 – it has the same width, only just a bit taller. First test: 25mW output setting. 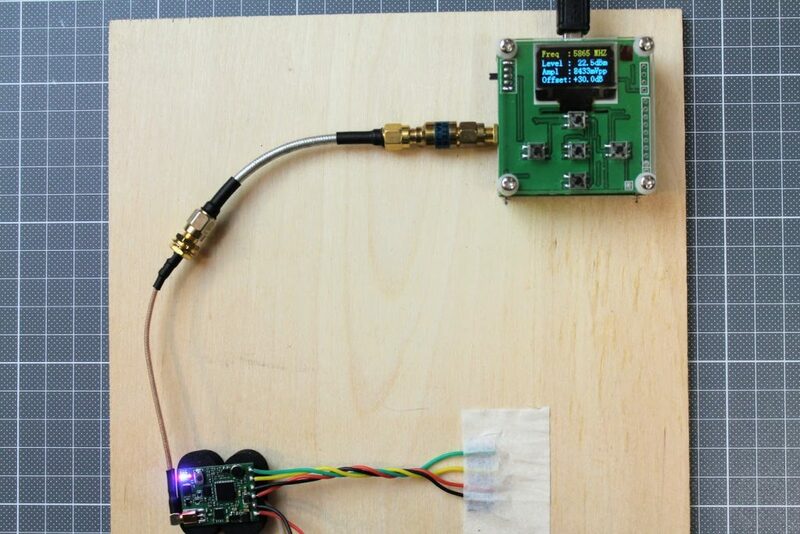 In the reality it is outputting 15mW (11.8dBm) and consuming about 1W of electrical power. At 200mW setting VTX outputs 178 mW (22.5dBm) and uses 1.38W. AKK Race VTX is designed for racing quads having in mind what the racers need. AKK has asked the community for features request and has listened to them, making the final result as VTX that people would really want. 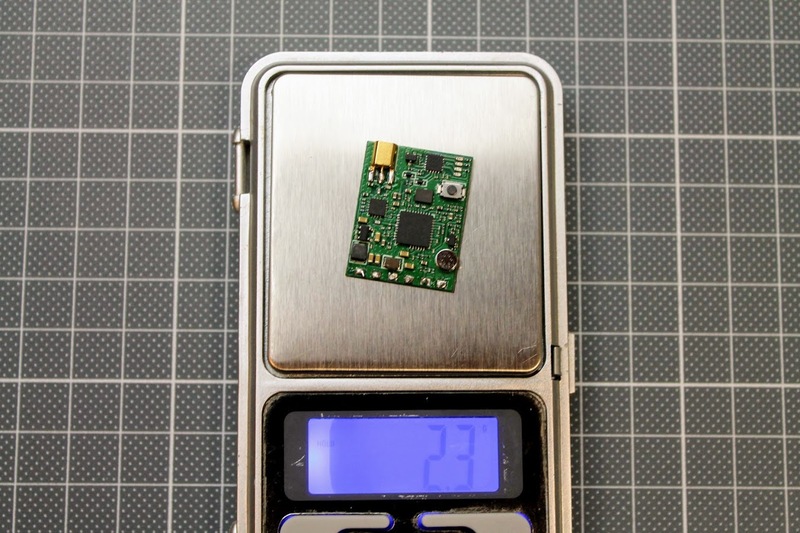 This VTX turned outquite small and very thin and could be mounted in the tightest builds, needing only 3.5mm of the space in height. 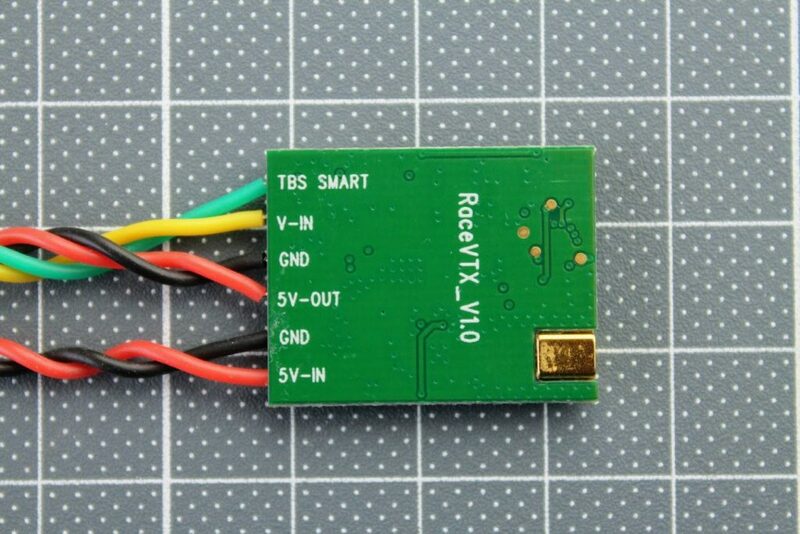 In fact it is pretty simple VTX, but simpicity makes it so light and small. Despite beeing simple it has a number of the good features that racers will love. It has SmartAudio controllable 37 channels on 5 bands, outputs 25mW and 200mW and also has pit mode. 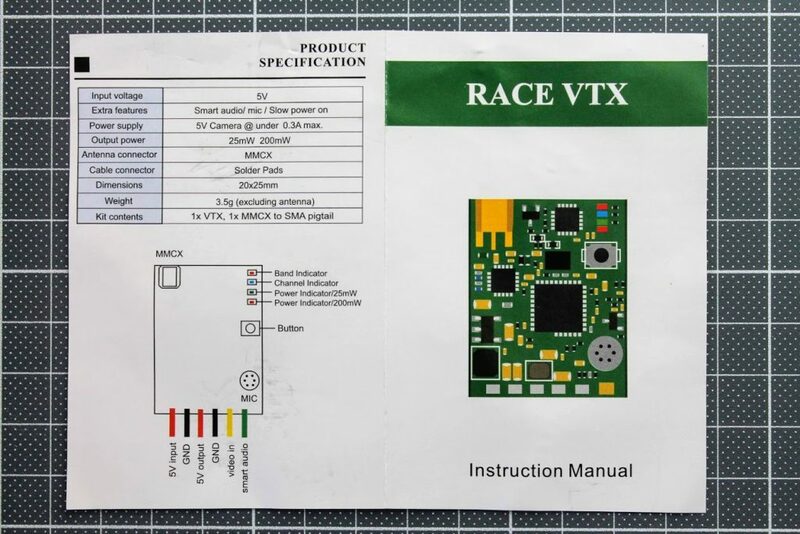 Race VTX has audio microphone on board, MMCX antenna connector, small LED indicators for status and even push button for manual settings. 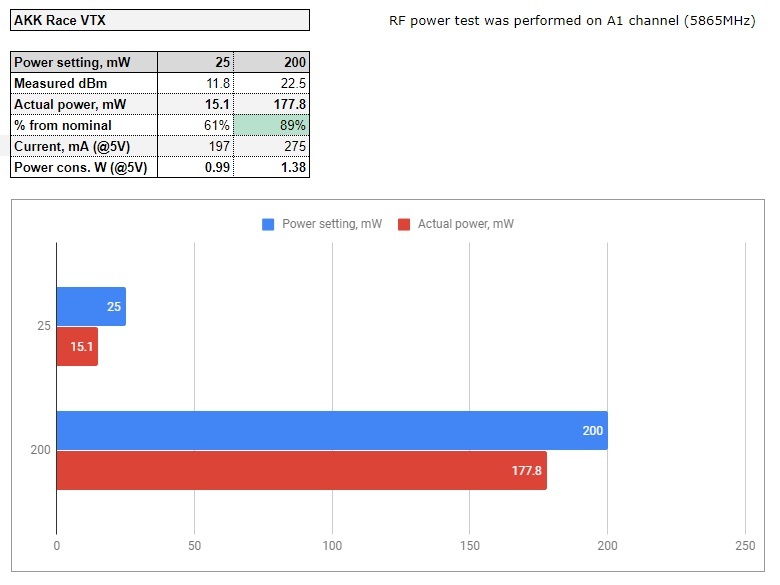 Power output test shows that this VTX does not exceed 25mW and 200mw limit on the entire Raceband range. 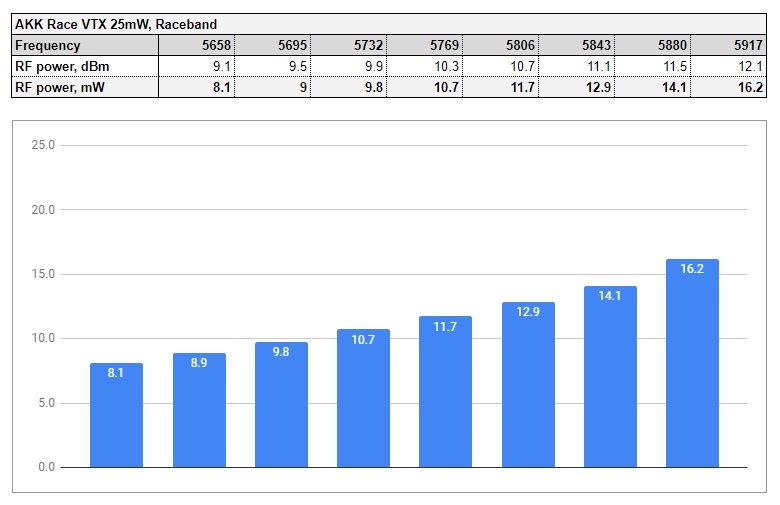 Measured values ranging from 8mW to 16mW on 25mW setting and from 85mW to 186mW on 200mW setting. Another one slightly negative moment is non linear Raceband power output on both power levels. Overall it is really nice VTX at the perfect price of only $9.99. Disclaimer: This item was bought by myself for a fair and unbiased review. AKK never asked for a positive review and never infuenced my opinion in any way. I’m trying my best to stay uninfluenced and give only my own opinion. All affiliate links if there are any help me purchase items for future reviews.